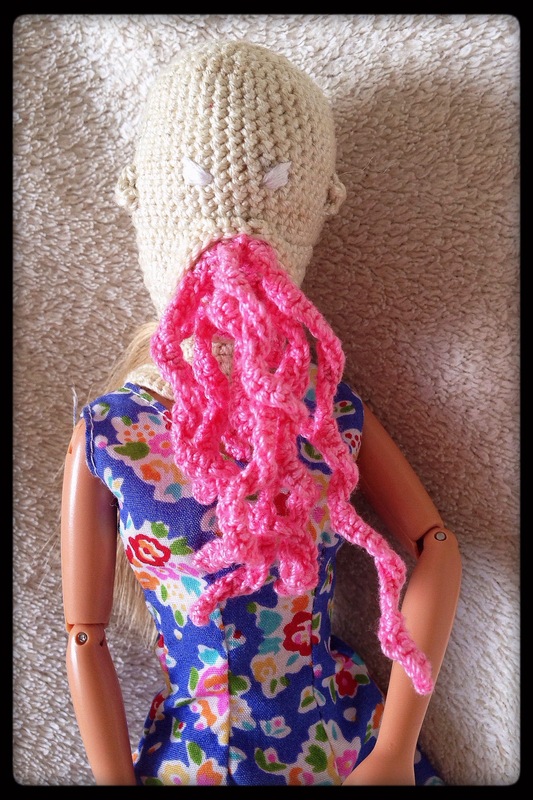 Prototype Ood Mask | Barbie Who? I’m back! Yay! Due to family circumstances, I was away from my home the last two weeks. That also meant I was away from my crafting supplies and the computer I use to create posts. So sorry that this suddenly popped up, but I’m sure everybody can understand that sometimes real life has to come before blogging. The good news is that I have an Ood mask to show you! This is a prototype Ood mask. It isn’t the final product, but rather one that I used to make a pattern and try out a few techniques. I used a hank of size 5 mercerized crochet cotton in the color ecru for the body of the mask. I bought it at a thrift store a few months ago – it was half off, so I got 2 hanks for $0.75. The brand is Lily Mills Company and it looks fairly old. I have never dealt with a hank of yarn before. After examining it and realizing that it needed some attention before I could use it, I started balling the yarn. It was hard at times (and tiring), but balling it up went very smoothly until the end. The last 3 yards were tangled into a big knot that took about an hour of my time and effort to fix. I felt very accomplished when I had the entire thing balled up. Once I had my tools ready, I was able to dive into the pattern. This Ood mask is inspired by a Ravelry pattern for an Ood Ski Mask by Lilana Wofsey Dohnert. The pattern on Ravelry is lovely, so I started by using the exact pattern with crochet thread and a smaller crochet needle. Much to my dismay, my first attempt at making the actual mask was tough. The dimensions didn’t scale down by just using smaller thread and a smaller hook. It turned out far too big and too short to fit well on the doll’s head. In addition, crochet thread has much less stretch than regular yarn, which caused it to be impossible to fit over her head. Once I realized this (after a few hours of work), I unraveled my work and started making my own pattern. Making my own pattern always has challenges because I am a bit of a perfectionist. I made the initial circle on top of the head too big with my first try (60 stitches), so I ended up unraveling three rows to where it was only 54 stitches around. I then worked that for 12 rows before I decided that was still too big. I think that, in my mind, there needed to be a lot of extra room for her hair, but it was just too much space. I unraveled all of those rows and reduced it down to 42 stitches. This made a mask that was snug but not confining, so I began to crochet to the length I wanted. My next problem was when I realized that I needed to get the finished mask over her giant doll-head without damaging my work or the doll. I decided that the easiest way to do this was to add a slit in the back, so I unraveled at least a dozen rows and added a slit with lacing holes. In the end, this will act like a Lucha Libre mask – it will cover the face and lace up tightly in the back. I still think I should have made that part longer (I have added that modification to the pattern and the second one should resolve this problem). After much frustration, I worked it long enough to cover her neck and cast off. I then added the ridge that goes around the mouth and the ears. The body of this first mask took about 26 hours of crocheting, unraveling, and modifying before it came close to what I wanted. When I make a second one to test out my modifications, I know it won’t take nearly as long. Once I finished the body of the mask, I had to embroider the eyes. My first attempt at this was a fail. They were uneven in every way, so I pulled those stitches out and did it again. The second attempt was better, but one eye was taller than the other. I went in and added more stitches to it, and I came up with the final eyes. They are more fleshed out and look nicer than before. They are exactly the eyes I was hoping for. It is a bit hard to see in these pictures, but I hope that you can see the difference between the two attempts at eyes. Once they were sewn on, I washed the mask with a mild dish soap and let it dry overnight. The final step was to create the tentacles. It was a giant pain! It is frustrating to work into chains with a tiny crochet hook and thread. Added to this, I wasn’t able to use the same tentacle technique as the inspiration pattern. Their tentacles looked too tightly curled, and it didn’t translate well to the smaller thread. I wound up experimenting with my own tentacles, and after many tries I found a technique that I was happy with. As you can see, this prototype is missing the white translator orb. I want this Ood to have a translation orb because it has white eyes (when I test out the pattern, I plan on make the mask have red eyes and a hindbrain). Anyways, when fist trying to create said orb, I had a mommy brain moment. I originally picked out some white thread, but it was size 30. It was the only skein of white yarn that I could find, so I figured that I would just make due with it. After struggling with the tiny thread for several minutes, I put it down and decided that using such small thread wasn’t worth the effort (it was hard to work with and was going to take a substantial amount of time to finish such a small item). Then I realized that I had another skein of white thread that I had used it to make the two Adipose. I have no idea where the yarn went, so for now the translation orb is on hold (pun intended). Since I am making this pattern myself, I am going to make a second Ood to wear the second mask. Once I finish the second mask, I will publish the finished pattern on the blog. 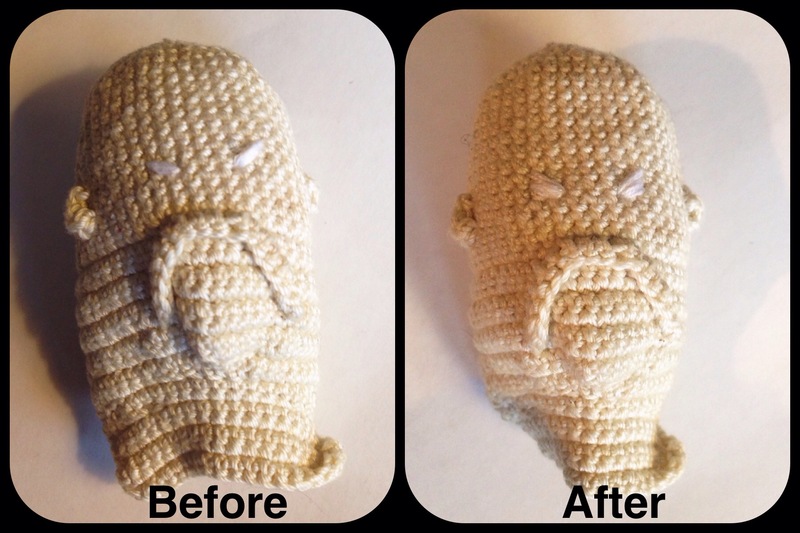 I don’t want to post it now because I will probably make a few more changes as I crochet the second mask. I want to give you the best pattern I can come up with so that other Whovians can create this for their dolls. That is it! I am currently working on some Ood pants now that I am home. I am a bit out of practice, but I hope to get back up to par quickly. Once I finish the pants, I will work on the second mask and the shirt that the Ood will wear. I am very happy to be back home and able to blog again. In addition to that, I will do a blog post or two with some cool crafting items I obtained while I was away. It should be fun! I look forward to the journey ahead. She is one of mine, too. She was so unique. What??? This is crazy amazing! I have never dreamed of making Barbies masks. My children heartily approve of covering her saccharine face. Nice work! And Soooooo much work. I’m totally blown away by your projects here!